Little Kid: You see that one picture? In the fourth row, 2nd from the top of the screen? Well it's facing the wrong way, and it's driving me nuts. You know, when I was promised my 72 virgins... this isn't what I had in mind. It's the Late Late Show with Craig Ferguson! Tonight's guests include King of Games Yugi Moto, comedian Koenma, and some guy from a zoo. Yami: Yeah, yeah, whatever. How about I just mind crush you? Oh, we're going to do that caption are we? Do you realize the Jinzo rule is and will forever be in effect. Oh, and by the way, the Jinzo rule is in effect. That means no over-using internet memes or Abridged Series quotes. I'll be watching you guys! If you wish, you don't have to, but you won't win with that quote. 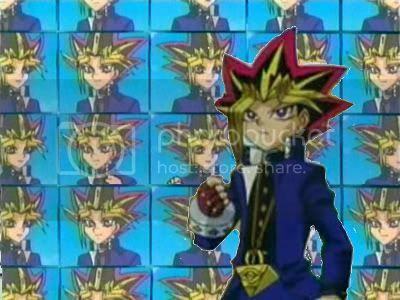 Narrator: "And the crowds went wild when they heard that Yugi Moto had been successfully cloned over a thousand times." Kids: Yay! The original YU-GI-OH is back on 24- 7.
i didn't win, so i can only assume you missed my entry, i.e. ":V"
for that reason my entry shall again be ":V"
Have you seen any of the previous winners? None of them won by using even a reference to YTAS. Alex: its a video daily double. Yami's tribute to Andy Warhol proved to be incredibly popular. "Screw you Kaiba, you have ONE big ego, but I have MANY small ones! (Yeah, Yugi's also somewhere around here)"
"That's the way we all became the YGOTAS bunch!" Yami has asked all his fanboys/fangirls to post their screencaps on a giant wall of Kaiba's tower. "Thank goodness Andy Warhol was never interested in children's card games..."
"The crowd began to erupt with joy when the animators announced that they had finally developed another opening sequence. However, this joy was soon rendered irrelevant when they realized that like the rest of the show, it was really just more generically drawn crap." "My name is Yugi. M. Moto, widely known as the king of card games. To the perpetrator of these unfair duels: You have committed the most abominal act in history. I will personally duel the one behind it... 'Kaiba' at any cost. So why don't you duel me! Come on! Do it! Come on! Duel me! What's wrong? Can't do it?"